Institutional buildings are usually named after a person for one of two reasons: The namesake has achieved great things on behalf of the institution, or he or she is a generous benefactor. Stanley Watson (left) was both to the Woods Hole Oceanographic Institution. 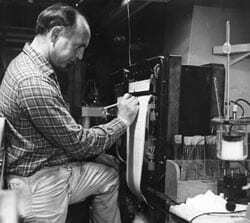 Watson, who died in 1995 following a 35-year career at WHOI, was a microbiologist whose research interests foreshadowed the cross-disciplinary field of biogeochemistry. He was instrumental in uncovering the importance of bacteria in ocean food webs and in the nitrogen cycle. He collaborated with John Waterbury, now a senior scientist in the Biology Department, in a momentous discovery. On a 1977 cruise in the Arabian Sea, they found extremely small, previously unknown photosynthetic cells in seawater. The cells turned out to be one of the most numerous organisms on the planet: the cyanobacteria Synechococcus. Watson also refined and patented a test for bacteria in seawater, using an extract from the blood of horseshoe crabs that reacts with fragments of the bacteria. In a successful second career as head of Associates of Cape Cod, Watson and company produced that extract—Limulus amoebocyte lysate (LAL)—which is used by hospitals and medical device producers worldwide to detect bacterial contamination and ensure safe products. Proceeds from the company formed the basis for the Watson Foundation, which has supported research and education at WHOI and other institutions for more than 20 years. In recognition of his leadership and generosity, WHOI will dedicate one of its new buildings as the Stanley W. Watson Laboratory.